I was commissioned for a very unique Mothers Day portrait last month by my friend Miranda. 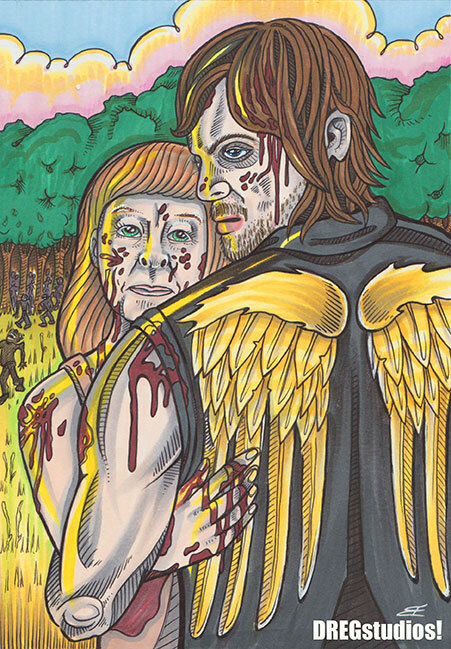 She wanted me to create a work of art featuring her mother Barbara and Daryl Dixon from The Walking Dead. Now the holiday weekend has passed, so I can share the new artwork with you! This was a lot of fun because it fused some fan art with portraiture which has become a specialty of mine. Miranda and Barbara are both artists themselves and I was all too happy to create this uncanny keepsake for them. This wasn't the first time I drew Barbara as five years ago, Miranda also commissioned me to draw a wedding portrait of her mother marrying Albert Einstein (click HERE to see)! Every wanted to see yourself along side your favorite celebrity? Email me at dregstudios@gmail.com to discuss your commission idea with me! I accept installment payments and can draw you WITH anything or AS anything you can imagine!